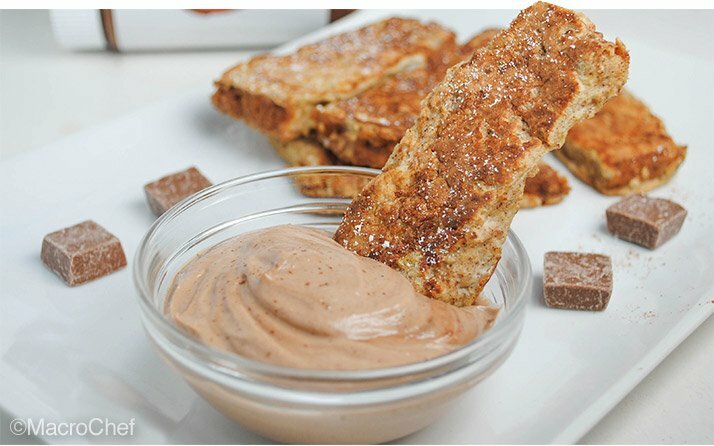 The names of these decadent breakfast creations might scare you away, but don't let them! The ingredients are rock-solid, and the macros are, too. Enter a new world of protein pastries! A sweet breakfast is the ultimate no-no for many fit people. After all, what could be worse than starting your day with something that not only tastes like dessert, but even has a name that could have come straight off of the menu of the nearest squeeze-yourself-into-the-booth pancake house? Don't run away yet! They call me the Macro Chef because I'm able to turn this situation on its head and see an "oh, yeah" where others see "no way." Each of these five recipes is high in protein and low in sugar, and has texture that'll make you rethink what a protein breakfast (or dinner, if you want) can be! I'm one of those people who counts the time between my last pancake and the next one. 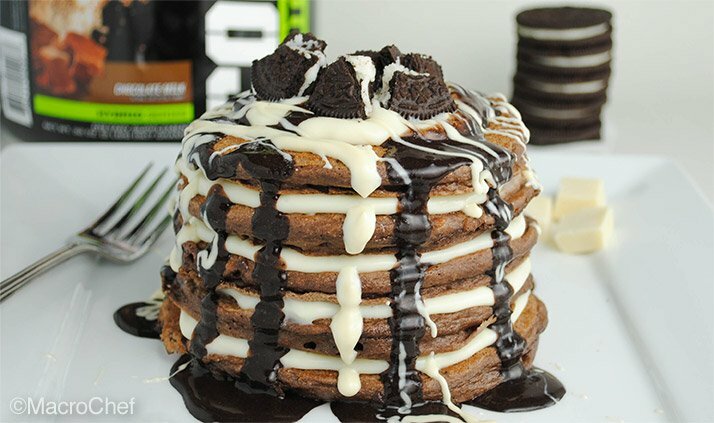 If it gets to be over a week, I need to take emergency measures—like whipping up a batch of these Oreo protein pancakes. These are really simple protein pancakes, but they'll taste incredibly decadent and tender. Why? It's the simple stuff: cocoa powder, chocolate-milk-flavored Combat Powder, and Greek yogurt, all of which boost the chocolate flavor and soft texture. The sauce doesn't hurt, either—or rather, the sauces! The way I prepare these babies, they have both a really easy dark-chocolate sauce and a white-chocolate sauce to recreate the cookies-and-cream vibe of an Oreo. Then, just for fun, I'll crunch up a single cookie on top. That part is up to you and your macros! I recently came home to a treat in the mail: MusclePharm's new White Chocolate Raspberry Combat protein bars. I had been dying to taste them and use them in a recipe. 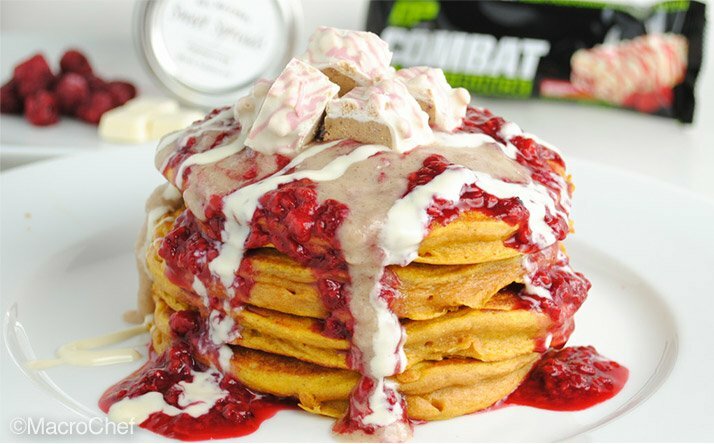 Then it hit me: Why not make white chocolate raspberry protein pancakes with the bars as a topping? These pancakes are some of the best I've made. It's not only because of the flavor, but also the awesome fluffy and moist texture they had. I added frozen raspberries into the pancake batter, and then I topped them with even more raspberries. For the raspberries on top, I heated them in the microwave with a couple tablespoons of maple syrup and mashed them together. Since no good meal is complete without chocolate, I added Sweet Spreads White Chocolate CocoNutter (which is way healthier than it sounds) and melted sugar-free white chocolate on top. 25G Fast Digesting Protein. Ultra Premium 100% Whey. My brother always tells me that I never share my food when I make pancakes or waffles. I hadn't really thought about it, but he was right! The only times I make pancakes or waffles are when I eat them myself as a meal. So I made these for him. 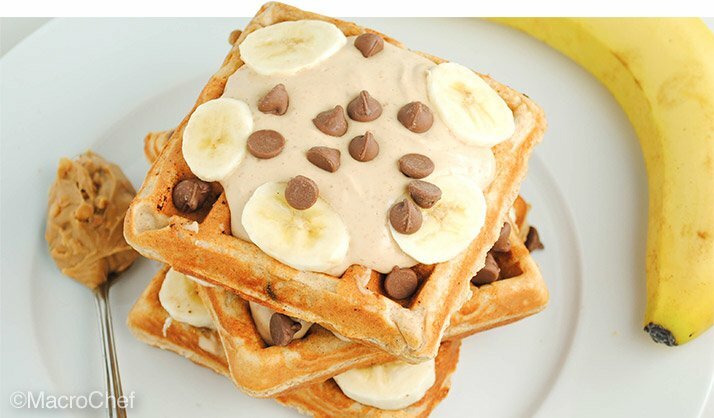 I was just going to make peanut butter banana waffles, but I decided to add some chocolate chips—you can never go wrong with chocolate chips in waffles. I love banana bread, and these waffles smelled and tasted just like banana bread. To make the waffles peanut-butter-flavored, I just used vanilla protein powder and added PB2 powdered peanut butter. It's basically defatted peanuts, so it gives the delicious peanut-butter flavor without the fat. I topped the waffles with a thick peanut-butter cream. I used plain nonfat Greek yogurt, natural peanut butter, maple syrup, and Stevia, but you can always use peanut flour and sugar-free maple syrup if you want fewer calories. Sometimes it seems that the less I plan a recipe, the better it turns out. Since I was busy doing school work for most of the day, I made these waffles for dinner on a whim. You can never go wrong with waffles for dinner—or any breakfast food for dinner, for that matter. The waffles themselves are pretty simple. 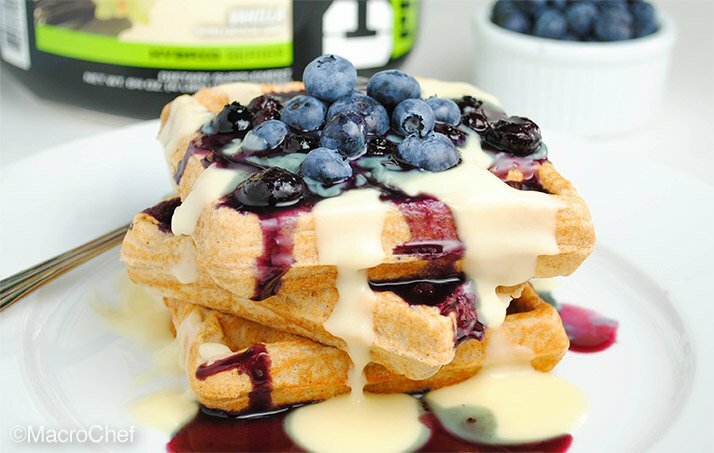 I used MusclePharm Vanilla Combat Powder, then added about half a cup of fresh blueberries. One of my favorite things to do lately with frozen fruit is to heat it up in a pan with some maple syrup. In this case, I just let it simmer a bit, and it magically transformed into a delicious blueberry syrup. For the cheesecake sauce, I used sugar-free cheesecake pudding mix and mixed it with water until it was a sauce. I love putting this on pancakes, waffles, or pretty much anything. It makes it taste like you are eating cheesecake! While scrolling through Instagram, I was recently inspired to try making French toast sticks. I'd never made them before, so why not now? I know it must seem weird that I'm offering up a breakfast food that isn't pancakes or waffles. I guess sometimes even I have to change it up a little. Boy, am I glad I did! I do wish I'd made more than one serving, though I; could have easily eaten another 20 of these. Spencer Miller's biggest passions in life are cooking healthy and cycling.